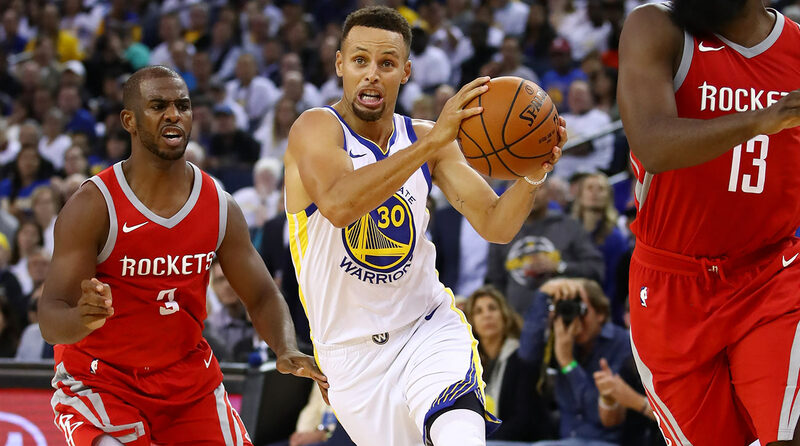 There are few things Andrew Sharp and Ben Golliver can agree on, but there is at least one common belief: Stephen Curry is the favorite to win the NBA's 2017-18 MVP award. Here's why. The NBA's MVP race always features a slew of interesting candidates, but the field is particularly loaded heading into 2017-18. For starters, you have LeBron James, looking to end a four-year MVP drought and reassert his status at the NBA's best player. To the east, you have LeBron's former teammate, Kyrie Irving, carrying the Celtics and possibly challenging for the scoring title. In the West, reigning MVP Russell Westbrook looks to incorporate two stars into mix and take OKC to the next level. And James Harden and Chris Paul are teaming up in Houston to form arguably the league's best backcourt with two MVP candidates of their own. But like all NBA discussions, this one ends with the Warriors. Golden State boasts two legitimate candidates (and maybe favorites) in Steph Curry and Kevin Durant. Will the two cancel out each other's chances for the 2017-18 crown? Not so fast, says Andrew Sharp and Ben Golliver on the most recent episode of Open Floor. The two hosts explain their predictions for this season's award. Andrew Sharp: Who do you have as MVP? Ben Golliver: Steph Curry, Golden State Warriors. Sharp: Me too! Make your case! Golliver: No, no, no! You seriously took him? Golliver: You told me you were going to take Kawhi like three weeks ago. Sharp: You know what? To be honest, I love Kawhi, and I loved watching him in last year’s playoffs. But I’m a little freaked out by two things. The first being his quad injury that’s going to keep him out of game one, and who knows exactly what’s going on there. But the second thing is: you’re starting to sell me on the Rockets winning 60 games and winning the No. 2 seed and it’s getting harder for me to give Kawhi MVP if he’s going to be third or fourth in the West. Golliver: My case for Curry is this: Golden State is not really a franchise where the torch gets passed from one superstar to another. It’s sort of like they just keep moving the torch around the perimeter until someone has a wide-open shot and then the defense gets emulated. To me, reasserting Steph Curry this season is as easy as a snap of the fingers. We saw it when Kevin Durant got injured last season, he’s still that same guy. He didn’t shoot the ball as well from three-point range last year and he made a concerted effort to bring guys into the fold. He’s gotten paid, he’s gotten his revenge against Cleveland, and he also had to listen to everybody talk about KD for four months. Surely, in his deepest heart of hearts, he truly believes he’s the best player in the world, because all of these super competitive guys do. I think that sets the table for a possible return to maybe not 100% to his unanimous MVP-level season, but 90-95% of that. And if Golden State wins 70 games, if Curry is leading the league in Plus/Minus and averaging 27-28 points per game and it’s coming easily, I think all of this talk about “splitting votes” and the Golden State fatigue factor will go out of the window. I just wouldn’t be surprised if it was Steph, even though I think KD is the better all-around player. And part of my logic goes to what Draymond was saying, where he was laughing at the rest of the league. Part of the reason why Draymond can laugh at the rest of the league is no one has solved the Curry problem yet. There’s not a defense that can take him away. And until that emerges, he’s still a guy who can get you 40 points in a preseason game, or 35 points in 20 minutes, or go off on these crazy scoring binges that have everybody tuning in and watching that game. I’m just not sure anybody else at this stage of their careers can do what he does. He’s still in his prime. That’s my case for Curry. Sharp: He is the best player on the best team the NBA has ever seen. This stuff shouldn’t be complicated. I do think, obviously, it’s more political than that. And after the two MVPs, which somehow became controversial around the league, it became murky. But, looking at the rest of the league and listening to people talk about this season, I’m sensing a rising tide of backlash against the Steph Curry backlash. Where I think everybody is going to realize he’s clearly the most valuable player in basketball this year. And barring an outrageous season from Kawhi or Giannis or someone, I just think we’re going to get to March and the Warriors are going to be on pace to win 70 games. If it’s between Steph and Durant, it should be Steph. Golliver: If it comes down to Steph or Durant, I think the basketball intelligentsia, I trust they will be able to crown one of those guys down the stretch. Let’s say Golden State wins 70 and no one else wins 60, or teams are struggling to, at that point the gap is so wide. We’ve already punished the Warriors superteam last season by not having one of their guys win MVP, it’s sort of like when LeBron first went to Miami, he didn’t win it the first year, but he did win it the next two years. I can see anyone saying, come March, guys like you and me will say, ‘Look, Golden State is so much better than everybody. We have to decide which one of their guys is going to get it.’ One of the guys will have a strong showing down the stretch and everybody will vote for that guy. I don’t know if it’s going to be Durant, I don’t know if it’s going to be Steph, but my money is betting on Steph.